Example is given for Pre-Query and Post-Query triggers in Oracle Forms, with using Display_Item built-in in Post-Query triggers to highlight fields dynamically. The example is based on HR schema departments table. In this example Department No. and Execute Query push button is in upper block named “Ctrl” block and below block is the departments block. User will be asked to enter department no. 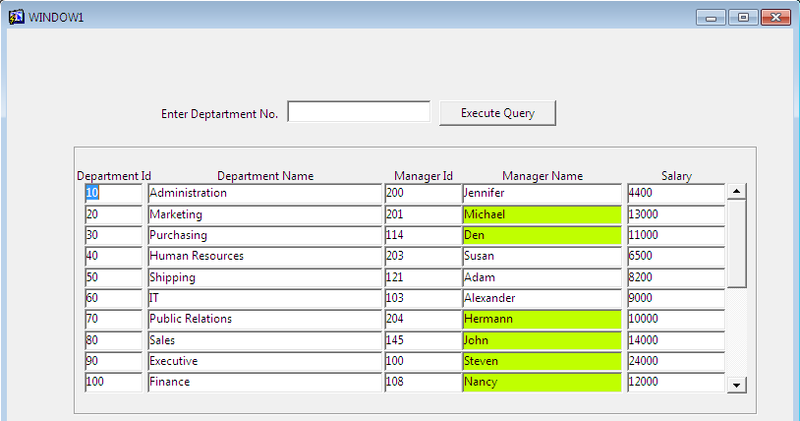 in above block and then to click on Execute Query button to filter the records below. The filtration is handled in Pre-Query trigger and after execution of query the Manager Name and Salary will be populated in Post-Query trigger by dynamically highlighting the Manager Name using Display_Item built-in.